Fraxel laser is the laser acne treatment for scars. Only available at medical practices, this laser is the most effective available. Call 02 9307 2833 and Book now! More Before and After images can be seen in the "Gallery" section. Watch a video explaining Laser Resurfacing. The medical grade Fraxel® Re:store DUAL laser is now established as the best laser to improve the texture of the skin, restore ageing skin and to reverse sun-damage. It is also now the treatment of choice for acne scars, and unlike Intense Pulse Light (IPL), can be used on all skin types including Asian and darker skin. This laser is the most effective of the Fraxel lasers available, and is only available at medical practices. 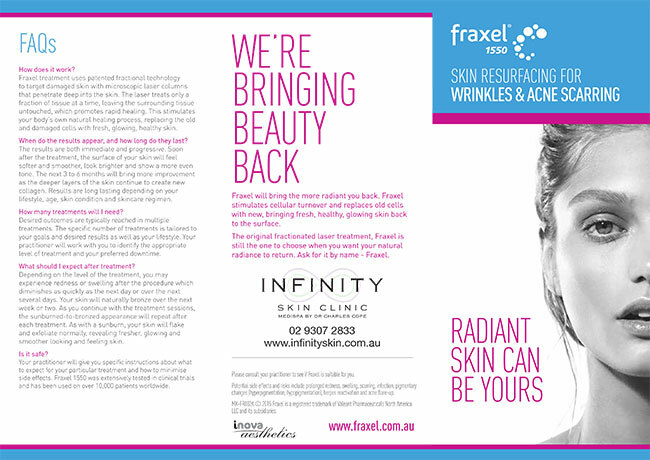 The Fraxel Re:store DUAL laser is a laser with two different wavelengths, one specifically treating concerns such as wrinkles or acne scarring that are deeper in the skin layers (1550nm), and the other (1927nm) effectively targeting brown ‘age’ spots and tone and texture, which are more superficial. Only one treatment with the 1927nm wavelength of the medical grade Fraxel Re:store DUAL laser will improve dark pigmented ‘age’ spots, as well as improving the skin’s tone and texture but it can take up to three treatments*. Three to five treatments with the 1550nm wavelength of the medical grade Fraxel Re:store DUAL Laser will show a significant improvement in acne scarring, and fine lines and wrinkles, as well as improving the skin’s tone and texture*. 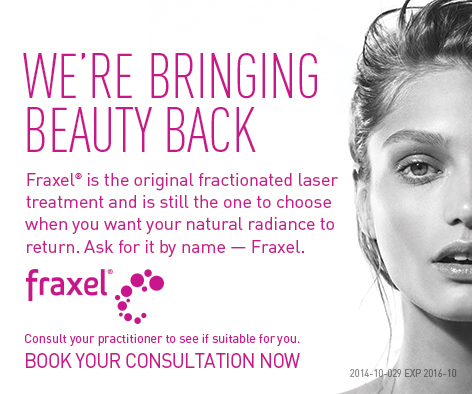 Fraxel® can be used for treating the face, neck, décolletage and back of the hands. Treatments are performed using a topical local anaesthetic cream applied to the skin one hour prior to treatment in the rooms. The treatment itself usually takes about 20-30 minutes, and afterwards it feels like mild sunburn. You may experience mild redness or puffiness for one to two days after the treatment, a bit like windburn when you ski. Some clients can return to routine activities, including work and social events, the same day, while some require one to two days off. Often clients have the treatment on a Friday and return to work on the Monday. You may also experience dry, itchy skin and some peeling or flaking and a bronzed skin appearance, 3 to 4 days after treatment. 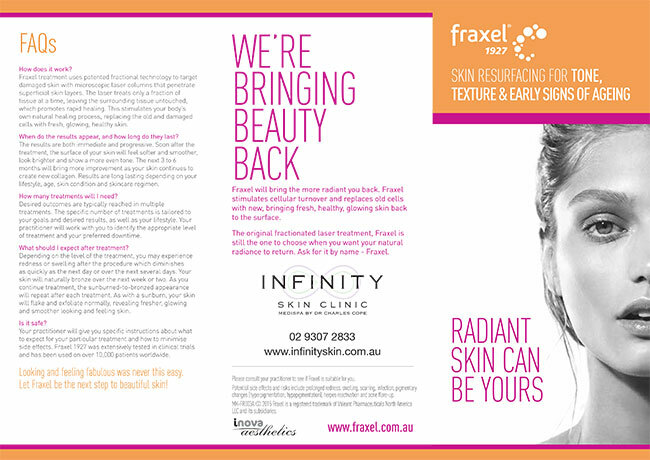 With a track record of over 800,000 treatments worldwide, Fraxel® technology has a proven record of efficacy and safety. Click here to see some before-and-after photos of our Fraxel re:store Dual Laser treatment. More information can be obtained by visiting the Fraxel website.